Home Ocean Facts What is the EEZ? This NOAA map shows the U.S. exclusive economic zone. The U.S. Exclusive Economic Zone (EEZ) extends no more than 200 nautical miles from the territorial sea baseline and is adjacent to the 12 nautical mile territorial sea of the U.S., including the Commonwealth of Puerto Rico, Guam, American Samoa, the U.S. Virgin Islands, the Commonwealth of the Northern Mariana Islands, and any other territory or possession over which the United States exercises sovereignty. Other rights and duties provided for under international and domestic laws. 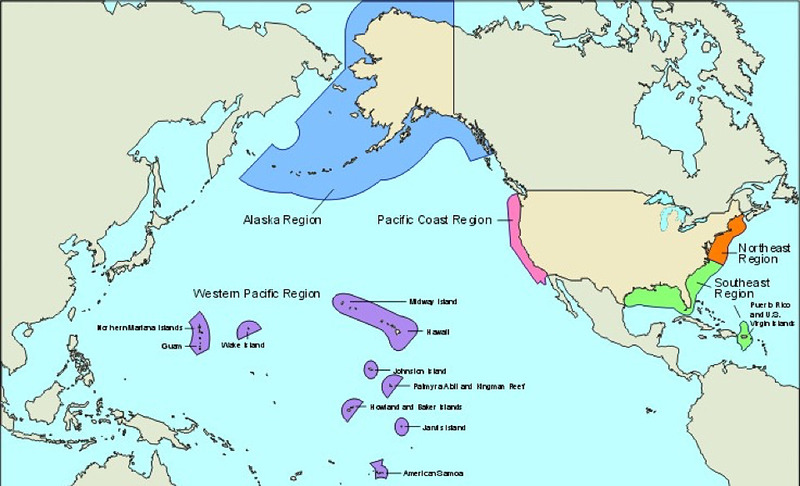 Note: Under certain U.S. fisheries laws, such as the Magnuson-Stevens Fishery Conservation and Management Act, the term "exclusive economic zone" is defined as having an inner boundary that is coterminous with the seaward (or outer) boundary of each of the coastal states. While its outer limit is the same as the EEZ on NOAA charts, its inner limit is coterminous with the coastal states' boundary at 3 nautical miles, except for Texas, western Florida, and Puerto Rico, which claim a 9 nautical mile belt. Federal Register, Vol. 60, No. 163, August 23, 1995, "Exclusive Economic Zone and Maritime Boundaries: Notice of Limits"